Hello! It's time for another Mojo Monday sketch (#279)! It's the first sketch of the month which means it's Mojo Contest Week... play along for a chance to win some Verve stamps! Today's fabulous sketch is brought to us by Julee. Since tomorrow is our anniversary, this is the card that I made for Dan. I used the newest Verve release, No Matter What. 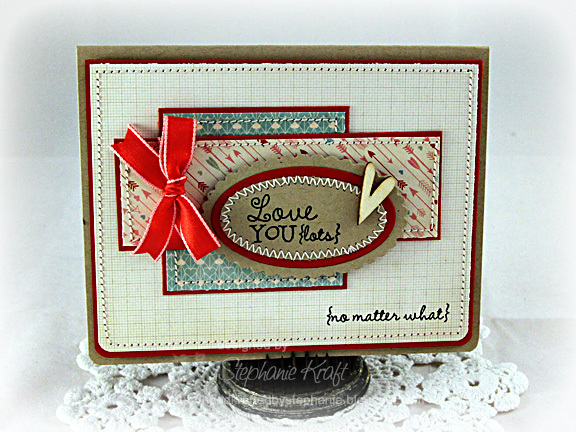 Accessories: Petite Oval Nestabilities - SM, LG and Scalloped Petite Oval Nestabilities - SM (Spellbinders); 1/4" Round-it-All (Zutter), Wood veneer heart (Studio Calico), Ribbon, Foam tape, Thread, Sewing machine. What a lovely anniversary card! Your stitching is always so perfect and that tiny heart is such a sweet touch! Have a wonderful Anniversary and you have a perfect card to give! Wonderful card! I love the stitching detail and sentiment. So pretty Stephanie! Love the little wooden heart! This is so beautiful, Steph! Happy belated Anniversary!!! What a beautiful card!!! !